Mee Grob comes as a snack and also a main couse. 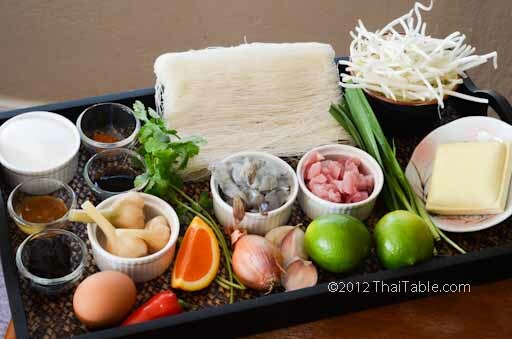 Mee Grob as a snack is also know as หมี่กรอบชาววัง, Mee Grob, the royal recipe. The common theme from the various palace recipes is that the ingredients are of highest quality, often hard to source and used generously. The palace recipes are optimized for the best flavor and presentation, not preparation time, labor efficiency or cost. 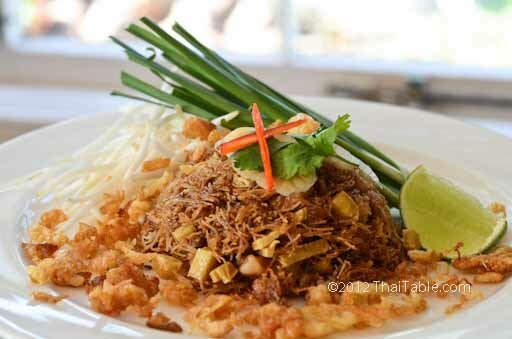 This dish is more elaborate than the Mee Grob you normally see with rice. Since it has pork and shrimp, this Mee Grob is best to eaten right away. The noodles are rinsed and let dry before frying, giving them the fried spring roll texture. Crispy fried beaten egg, pickled garlic, bean sprouts and Chinese chives add different textures and flavors to Mee Grob . The lime cuts the strong flavors of tamarind and sugar and brings refreshing citrus flavor. 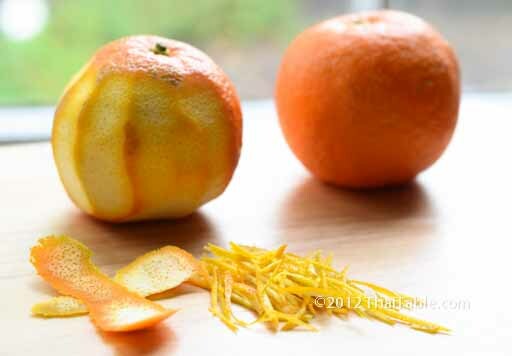 If you can get ahold of som sah (seville orange), the zest gives it a unique flavor, telling you, you have the real Mee Grob. 3 1/2 oz of rice vermicelli noodles is about 1/5 of a package. There are 5 flats in a package, just pull one out. Rinse the noodles quickly. Do not soak the noodles! You want to fry the noodles later. Water logged noodles will be sticky when frying. You are aiming to lightly rehydrate the noodles to get the spring roll crispiness when fried. The tamarind paste that I use in this recipe is the dry tamarind pulp that is thick like sour cream. If you are using tamarind in pods not the processed tamarind, use 2 ounces of tamarind with 1/2 cup of water. This will yield about 1/2 cup of tamarind. Omit the water in the recipe. 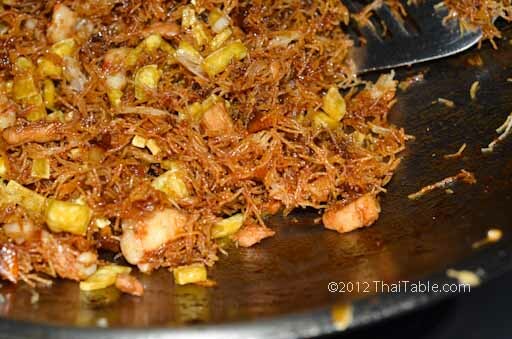 Som Sah or Seville orange juice and zest are key ingredients in making this mee grob a royal recipe. However given that even in Bangkok, it's not easy to source the Seville orange, orange juice and zest is an ok substitution. While oranges turn from green to orange as they ripen, in Thailand we'd use the zest of a green orange. This is similar to kaffir limes where we use them when they're green instead of the ripe yellow. 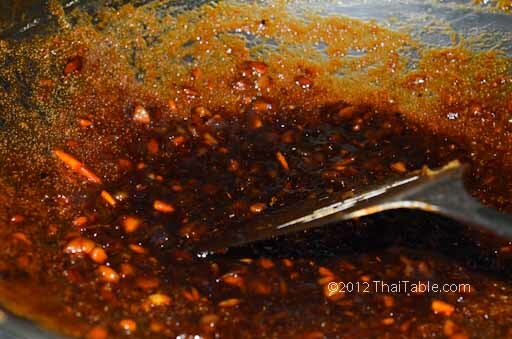 The thickness of the sauce determines how crispy your mee grob will be. Less moisture will keep Mee Grob crunchy. If you can't find Chinese chives, skip them. Don't substitute with green onion. You will not get the flavor or the authenticity. 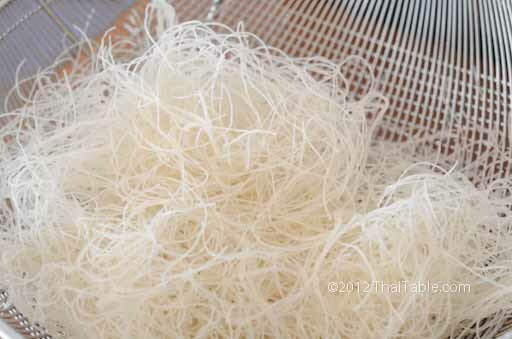 Quickly rinse rice vermicelli in cold water and let them air dry while prepping other ingredients. When the noodles are ready, the strands are flexible and stretchable. Julienne the tofu. Carefully cut the orange zest, try not to get much pith (the white part). Then, thinly sliced the zest into strips. Squeeze the orange juice and set aside. 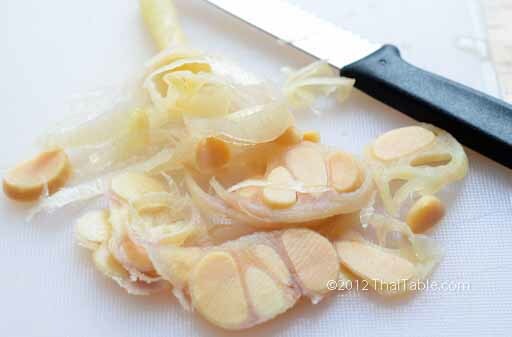 Thinly slice pickled garlic cross sectional (picture 3). Cut Chinese chives at both ends to get 4-inch stalks for garnishing. 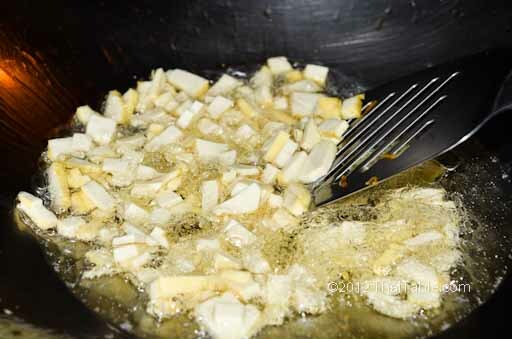 Add 1 ½ cup of oil into a wok or a big pot. Let the oil heat up. 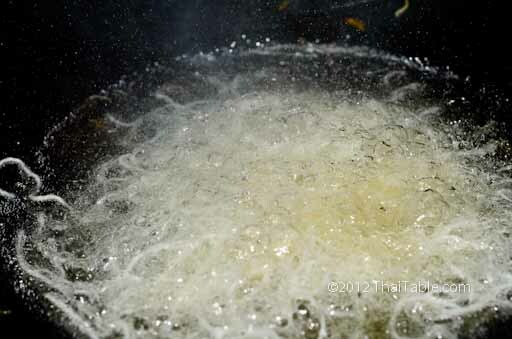 Frying the noodles: To see if the oil is ready, drop a noodle strand into the hot oil, it will puff up right away. Put a handful of noodles into hot oil. Flip to get the topside into oil. It takes about a minute for each handful. When the noodles start to turn golden brown, strain the noodles out of oil. Fry the rest of the noodles a handful at a time. The fried noodles will puff up less than if they were fried directly from the package without rinsing. However, that's the correct way of doing this type of Mee Grob. Frying the tofu: Fry the julienne tofu until golden brown. Frying the egg: Beat the egg until the white and yolk mix well. Again the oil should be hot. Pour the beaten egg slowly through a strainer over the wok. 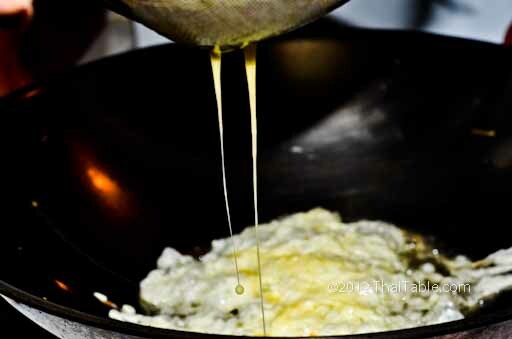 Shake the strainer to drizzle thin streams of the egg into the hot oil. The egg will puff up right away. You don't want a big patch of egg but small drops and thin strands. Fry until the egg is golden brown and crispy on both sides, about 5 minutes. Strain the egg out the oil and set aside for garnishing. Pour out all but 2 tablespoons of the oil. Add chopped garlic and sliced shallot in the wok, over medium heat. When the garlic and shallot turn brown, add ground chili pepper, yellow bean sauce, sugar, water, orange juice and half of zest, water, 1 tablespoon of lime juice, tamarind and fish sauce. Stir to mix and dissolve the sugar. Turn off the heat or keep on lowest setting (to keep the sauce fluid). Add the fried noodles. With 2 spatulas, gently mix the noodles with the sauce. Stir to get the sauce on all the noodles. Gently break up clumps. Mee grob should be brownish orange. Sprinkle the rest of the orange zest on Mee Grob. Scoop Mee Grob onto a plate. Add a handful of bean sprouts, a slice of lime and a Chinese chive. Sprinkle sliced pickled garlic, crispy fried egg, red chili pepper and cilantro. The noodle strands should be small, not super puffy like when you fry them without rinsing. The noodle color should be reddish brown from tamarind, not bright red (from ketchup). 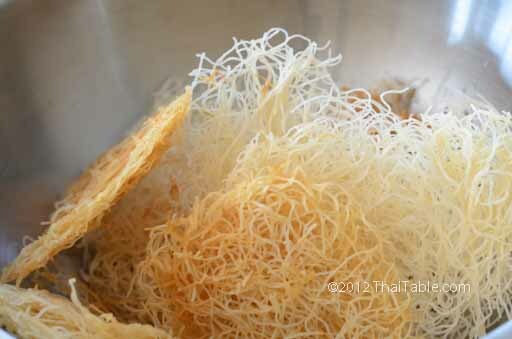 Mee grob should be crunchy, similar to fried spring roll crunch. Once, when you squeeze lime juice onto the Mee Grob and eat it with bean sprouts and Chinese chives, the flavor should be well balanced between the sweet and sour. If you add Seville orange zest, the unique aroma of the zest makes the dish. If this recipe seems exhausting to you, check out this Mee Grob.